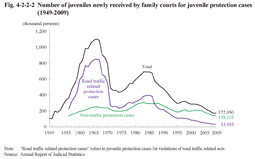 The number of juveniles received for non-traffic protection cases (refers to juvenile protection cases but excluding those pertaining to violations of road traffic related acts) reached a peak in 1966 and again in 1983, but then continued to decrease for a number of years. In recent years it has remained at around 200,000, but has been decreasing every year since 2004. 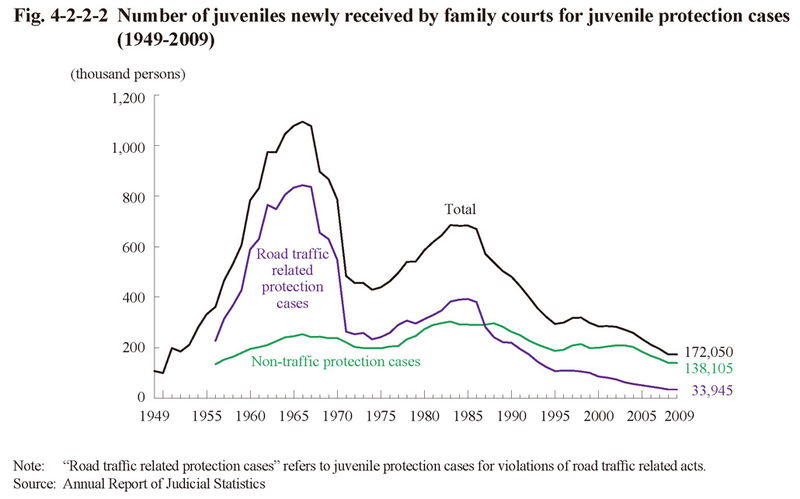 The number of juveniles received for road traffic related protection cases (refers to juvenile protection cases pertaining to violations of road traffic related acts) decreased sharply after the traffic infraction notification system was made applicable to juveniles in 1970 and its scope of application expanded in 1987. The number has subsequently been on a decreasing trend, even in recent years. Fig. 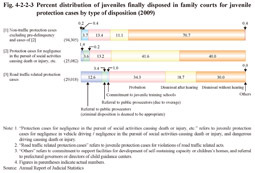 4-2-2-3 shows the percent distribution of juveniles finally disposed in family courts for  non-traffic protection cases but excluding pre-delinquency and protection cases for negligence in the pursuit of social activities causing death or injury, etc. (cases of ),  protection cases for negligence in the pursuit of social activities causing death or injury, etc. 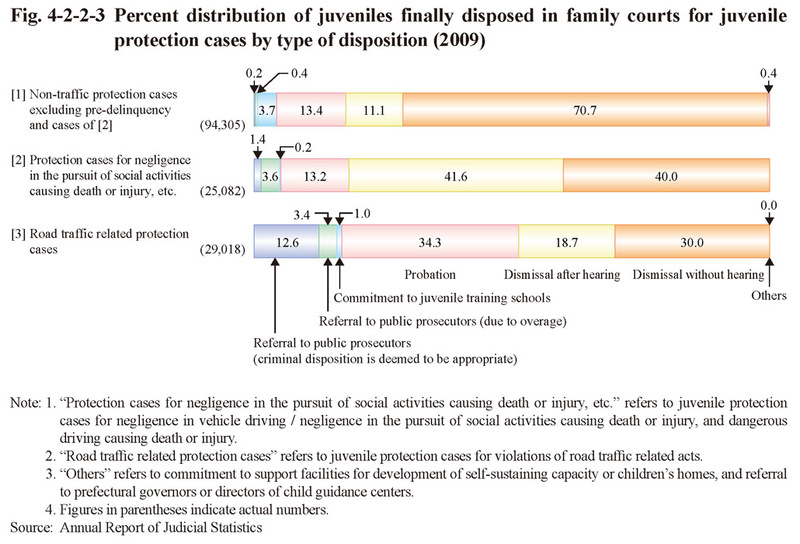 (refers to juvenile protection cases for negligence in vehicle driving / negligence in the pursuit of social activities causing death or injury and dangerous driving causing death or injury), and  road traffic related protection cases by type of disposition in 2009. Cases involving a juvenile aged 16 or older caused death of a victim through an intentional criminal act, in principle, has to be referred to public prosecutors for prosecution. 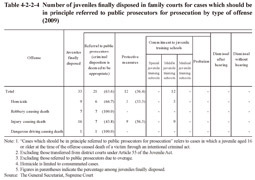 Table 4-2-2-4 shows the number of juveniles finally disposed in family courts for such cases (excluding cases where juveniles were referred to public prosecutors due to being overage) by type of offense in 2009. 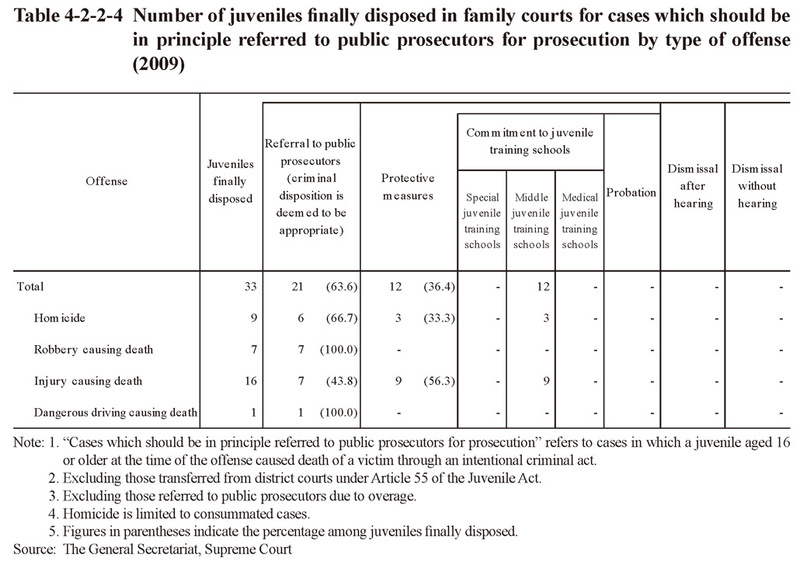 During the period from April 1, 2001 through to the end of 2009 a total of 483 juveniles were finally disposed for such cases and 305 (63.1%) referred to public prosecutors for prosecution (Source: The General Secretariat, Supreme Court).